It is proposed that we release Elders L. Aldin Porter and Marlin K. Jensen as members of the Presidency of the Seventy. It is also proposed that we release Elders L. Aldin Porter, Vaughn J. Featherstone, Rex D. Pinegar, John K. Carmack, and L. Lionel Kendrick as members of the First Quorum of the Seventy and designate them as emeritus members of the First Quorum of the Seventy. All who wish to join with us in doing so, please manifest it. 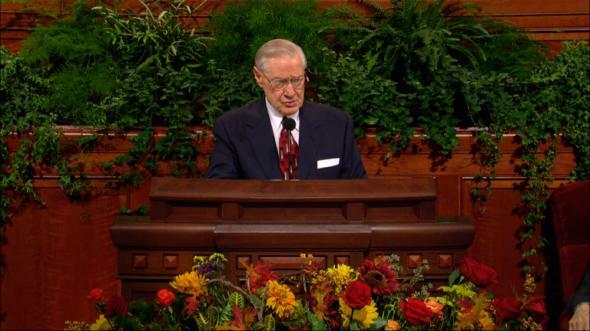 With gratitude for their service as members of the Second Quorum of the Seventy, we extend an honorable release to Elders Richard B. Wirthlin, Richard E. Cook, Wayne M. Hancock, and Ray H. Wood and to the following as Area Authority Seventies: Norman C. Boehm, Jess L. Christensen, Dale L. Dransfield, David W. Eka, James E. Griffin, Esteban Guevara, Ronald J. Hammond, Thomas A. Holt, Ernst Husz, Julio H. Jaramillo, Lloyd W. Jones, Seiji Katanuma, J. Grey Larkin, Haruyoshi Nakamura, Karl E. Nelson, Jesús Nieves, Rodrigo Obeso, James S. Olson, Glen A. Overton, William W. Parmley, Steven H. Pond, Michael T. Robinson, Jorge W. Ventura, and Craig T. Vincent. Those who wish to join in an expression of appreciation, please indicate by the uplifted hand. It is proposed that we release with a vote of thanks Elders Marlin K. Jensen, Neil L. Andersen, and John H. Groberg as the Sunday School general presidency; and Elders Robert K. Dellenbach, F. Melvin Hammond, and John M. Madsen as the Young Men general presidency. All in favor, please signify by the uplifted hand. It is proposed that we sustain Elders Charles Didier and Cecil O. Samuelson as members of the Presidency of the Seventy. All in favor, please manifest it. Any opposed, by the same sign. It is proposed that we sustain Carlos J. Garcia, R. Randall Huff, and John W. Yardley as Area Authority Seventies. All in favor, please manifest it. Any opposed. It is proposed that we sustain Elders Cecil O. Samuelson, John H. Groberg, and Richard J. Maynes as the Sunday School general presidency and Elders F. Melvin Hammond, Glenn L. Pace, and Spencer J. Condie as the Young Men general presidency. All in favor, please manifest it. Any opposed.